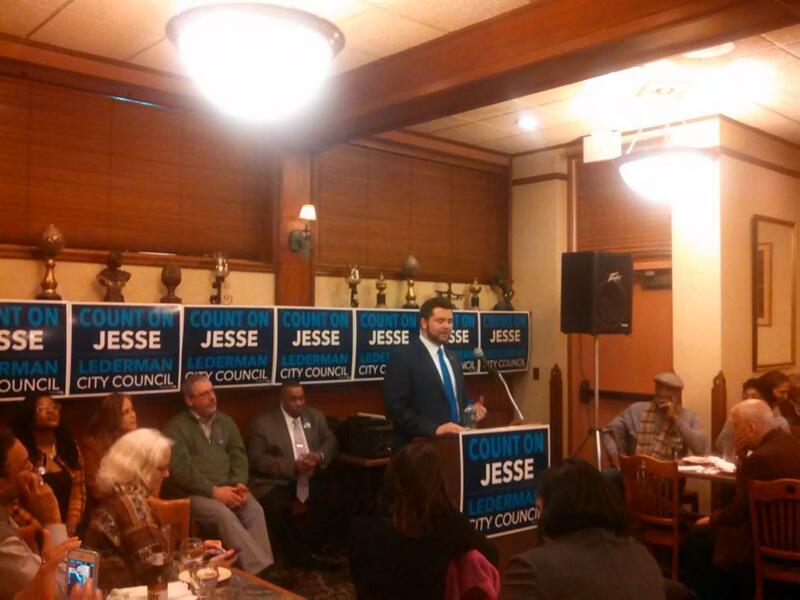 SPRINGFIELD—Entering after a rousing introduction from his political mentor E. Henry Twiggs, longtime city activist Jesse Lederman, a McKnight neighborhood resident, formally kicked off his bid for City Council at-large Wednesday night. Promising to bring a smarter, more innovative direction to 36 Court Street, Lederman called for an activist city government working for its residents. A crowd of at least 100 consisting of activists, politicos, friends, family and more, packed the function room of Red Rose Pizzeria in the South End cheering as Lederman shook hands and embraced supporters on his way to the front of the room. The event, the first of the city’s political cycle, came several weeks after Lederman began organizing his campaign. “He’s ready for the City Council,” Twiggs boomed. Perhaps half-joking that he needed to keep an eye on the young pol, Twiggs said he met while the latter was putting up campaign signs. A local icon of the civil rights movement, Twiggs said he saw some of himself in Lederman and recruited him to help out on Springfield Democratic committees. Although “Get Ready” by the Temptations played as Lederman entered the room, many present were likely prepared for such an event. A veteran of several campaigns and big municipal political fights, it was probably only a matter of time before Lederman sought office. Notables ranged from Twiggs, Ward 4’s councilor, Councilors Melvin Edwards, Just Hurst and Zaida Luna to electeds from neighboring towns and the Massachusetts Democratic Vice-Chair, a sign of the 19 year-old candidate’s broad array of relationships. Dressed in a dark blue suit with a bright blue tie and sporting a neatly trimmed beard, the UMass-Amherst student did not seem a baby-faced newcomer. A former teacher of Lederman’s, Stephen Cary, recalled his first encounter when Lederman was in high school. His lesson plan was upended when Lederman interjected the topic of Springfield’s changing city government. Around the same time he became a lead opponent of the proposed biomass plant on Page Boulevard. The Council rescinded the plant’s permit sometime later, although the matter remains in litigation. In the aftermath of the biomass fight, Lederman transitioned from issue activism to political activism, working on council campaigns in 2011 and 2013, a 2012 state senate campaign and statewide bids. He served as a field organizer for Ed Markey, Don Berwick and Deb Goldberg. “As I worked the room, I’ve found I have a lot of adopted parents,” Lederman said in an ad lib from his prepared remarks. But in his speech, Lederman offered a positive, progressive vision for the city that embraced its diversity—both cultural and economic—but not tinted by nostalgia for bygone times. Such nostalgic outlooks are typical in Springfield, but often come with a whitewash of that era’s problems, challenges and past mistakes. Speaking of his home in McKnight, “where a restored Victorian mansion could sit next to a public housing project, with everything in between up and down the block,” Lederman described neighbors helping each other and the families growing up there. Additionally, he called for community policing and a revived police commission to both ensure officers are treated fairly and investigate residents’ complaints. Such a move would take time as Police Commissioner John Barbieri’s contract—which gives him sole power over discipline—runs through 2019. “We need more than just ‘tough on crime’ rhetoric,” Lederman said taking an indirect stab at incumbent city officials, who historically have recycled such language for years. Lederman was not without tried and true Springfield applause lines. Praising the restoration of the Mason Square branch library as an example of local government’s power prompted cheers. But he was realistic, too, noting he would only be one voice of thirteen. The pitch included the normal appeals for money and volunteers. Shanique Spalding, who emceed yesterday and serves as chair of his campaign committee, took the lead on that push with an energetic appeal just before Twiggs spoke. So far all five incumbent at-large councilors are expected to seek reelection, although that was the case in 2013 as well. The 2013 race featured two incumbents—one at-large and one in a ward—losing their seats, offering hope to challengers like Lederman this year. Yet turnout will be higher due to the mayor’s race, complicating what to read into 2013’s results. Judging by the music selection, Lederman’s campaign appears undaunted. “I Won’t Back Down” by Tom Petty began playing after the candidate concluded his remarks.